Brikena Avdyli has been part of the IFES Kosovo team for over three years, serving as the focal point for the Kosovo inclusion project. She currently serves as Project Officer for Election Support and Public Outreach, where among others she also works towards inclusive electoral processes. Brikena has a master’s degree in international development from American University in Washington D.C. and has recently completed a certificate program on diversity and inclusion at Cornell University. Prior to IFES, Brikena has worked with various civil society organizations in Kosovo in the area of inclusion of different marginalized groups. An interview, which has been lightly edited for clarity, is available below. What was one of the biggest inclusion successes of IFES and the CEC in Kosovo? 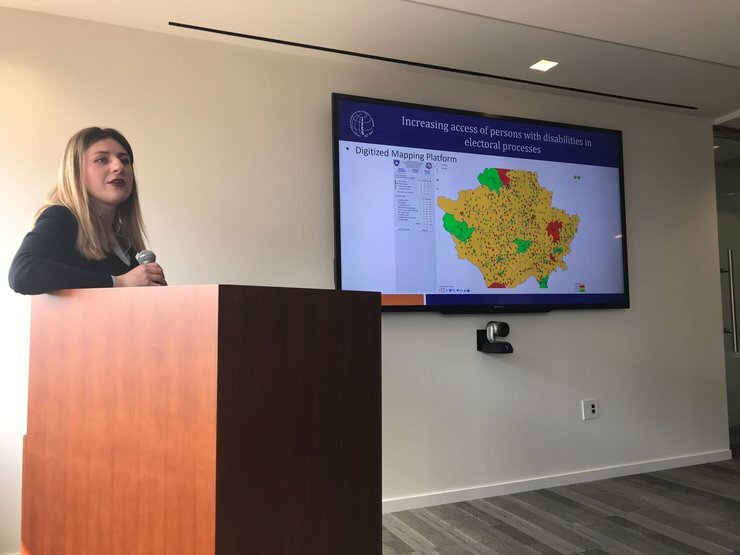 In the 2014 Kosovo National Elections, IFES and its sub-grantee Kosovo Democratic Institute (KDI) led the biggest disability access monitoring mission in Kosovo. The mission included over 250 observers with disabilities who monitored election day activities. Thirty individuals also monitored the electoral campaign, which marked the first activity of this kind in the world. Through the monitoring mission, observers with disabilities collected data for two thirds of polling centers in Kosovo, as well as other election related locations such as municipal election commission offices, political entity offices, and campaign venues. The data for the remaining polling centers was collected in a non-electoral period, where the Municipal Election Officers worked with persons with disabilities to assess the accessibility of polling centers. The information was used to build the Central Election Commission’s (CEC) Digitized Mapping Platform, an online platform that interested parties can use to see if their polling center is accessible. If their polling center does not have access, they can use the platform to find the closest accessible polling center. During a specific timeframe in the election period, they can submit an electronic request to CEC to change their polling center to the accessible one. Did you encounter any challenges to this success? How did you address those challenges? One of the challenges has been keeping this matter a priority for all stakeholders, particularly given the series of extraordinary elections and the long list of barriers that persons with disabilities in Kosovo face. For two years IFES has supported and facilitated the work of the Election Access Group (EAG), a multi-stakeholder group working towards disability inclusive electoral processes. The group has published three manuals, including the Manual for Utilizing Media for Advocacy, Manual for Terminology and Correct Approach for Persons with Disabilities, as well as the Manual for Inclusion of Persons with Disabilities in Electoral and Political Processes. The EAG has also facilitated a memorandum of understanding for employment of persons with disabilities, between the CEC and four of the biggest DPOs in Kosovo: HandiKOS, Association of the Blind of Kosova, Kosovar Association of the Deaf, and Down Syndrome Kosova. However, until now the group members did not take leadership in initiating and implementing activities, and depended a lot on IFES for this. The DPOs of the group are already overloaded advocating for the necessary changes in the disability community, such as quality healthcare, access to education, physical access to public buildings, employment, integration in the society, and others, and the work of the EAG has to compete with a lot of these priorities. For this reason, IFES advised and supported CEC in taking the lead in running disability inclusive elections, in close coordination with the DPOs. This way, the DPOs can directly work with the CEC to initiate and implement the necessary changes without having to choose between priorities, and the CEC can learn in the process and maintain ownership of all efforts. What lesson would you share with election officials around the world about making elections accessible to and inclusive of persons with disabilities? It is imperative for electoral management bodies to understand the barriers of persons with disabilities in the electoral process, their right to be included and have access, as well as the value that inclusion brings to the process. The best way to learn about these is to talk directly with persons with disabilities, and when policies are drafted and activities are planned, ask for their feedback. Simulations like going through a polling station in a wheelchair or blind folded, receiving the same treatment like persons with disabilities, also help election officials better understand their position. And when there’s genuine understanding there are more serious efforts to make elections disability inclusive because it is the right thing to do, and not as a good deed for persons with disabilities. Now there are a variety of good practices that election officials can pick and choose from, and adjust them to their own context. All it takes is determination to becoming inclusive, which should come in the form of designated budget, policies, and activities.